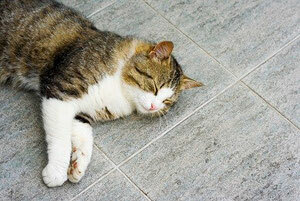 Why should you heat your tile floors? A cozy floor is a happy floor. Floor warming systems offer underfloor heat that keeps bathrooms, kitchens, and entry ways dry, safe, and cozy. By drying up water in entryways and bathrooms, you're making your home safer and your tile floors less slippery—a must for older homeowners and houses with children. By warming your basement, bathroom, or kitchen, you're making your home more comfortable and your tile floors less chilly—ideal for early mornings and long winters. 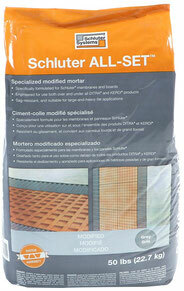 We stock Schluter's Ditra Heat System in our store. Below we'll outline the pro's and con's of the system and offer you a price breakdown of materials and energy costs. Ditra Heat is the hot new product from Schluter Systems. Easy: Simply thinset down the Ditra Heat mats, snap the cables into place, and tile on top. Quick: Instead of waiting for layers of thinset and self-leveller to dry, you can install your underlayment (Ditra Heat mats), heat system, and tile all in just one day! Lightweight: No heavy cement boards. Thin: Your Ditra Heat mat and wire cables are only an 1/4" thick total, while a traditional 1/4" cementboard + an 1/8" heat cable with 1/4" straps creates a thicker sandwich of materials under your tile that could make your floors much taller than the adjoining carpet or wood floors. 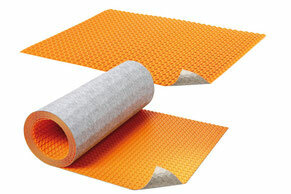 Waterproof: Instead of painting on a waterproof coating, adding yet another layer to your floor, simply use Schluter Kerdi Band to cover any seams or cuts for a waterproof underlayment; great for preventing moisture from seeping through the concrete slab in a basement or preventing splashed water or burst pipes in a bathroom from dripping down and causing issues below. Calculate how much Ditra Heat cable you need for your room! Use this helpful sheet to figure out which size cable kit to get for your space. 7-Day Programmable Thermostat kicks on in advance so the floor is warm when you need it to be warm. Hundreds of different settings to suit your needs. Easy-to-String Heat Cables for a completely custom layout. Thinner Overall Installation so your heated floor is not taller than adjoining floors. Due to the fact that Ditra Heat is a simple, all-in-one underlayment and heat system kit, it has the Fastest Installation Time of all heat systems we know. What extra you spend on materials is mitigated by time saved (and when hiring a contractor, time is money). NOTE: Prices accurate as of 5/13/2017. Prices subject to change. Materials specified are based on a typical installation. You may need fewer or additional items depending upon your unique situation. 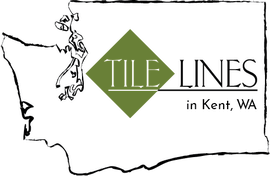 Ask a Tile Lines employee for more assistance or a price quote. What will a heat system add to my electric bill? If your heat cables are set at 3" apart (standard spacing), and the system is on for an hour a day, it will add appx. $.03 to your monthly bill for each square foot that's heated. Most people only have the heat system on for a few hours in the day, usually just to warm the bathroom floor when getting up in the morning. Consider when and where you want your floors cozy when choosing a heat system. NOTE: Prices calculated based on Puget Sound Energy prices as of 9/10/2014. These are rough estimations for the purpose of assessing the long-term cost of a heat system and are not a guarantee of your actual bill. Wire spacing, size of the heat system, insulation, total electrical usage of the household, and other variables will affect the per square foot cost of the kit. Check your local building codes to see if there are any rules or regulations pertaining to in-floor heat systems before you purchase or install one. Sometimes an inspection by an electrician is required by law, while sometimes it's optional. Also consider what is required for your kit's warranty. Does it require an inspection by an electrician, or could you simply do the test yourself with an Ohm's Meter to qualify for the warranty? You may need to run a dedicated circuit for your new installation. You can consult an electrician to ensure that your new heated floor will be installed correctly. Do you need a thermal break? A thermal break is an insulating layer that keeps your heat where you want it. A thermal break layer under your in-floor heat system will bounce the heat back up into the room, so very little heat escapes into the space under the floor. More energy (and money) is saved as you're not losing a lot of heat into the space below your floor. A thermal break layer will usually add between 1/4" and 3/4" to your floor, potentially making it too tall to meet up to adjacent floors without a sloping ramp or transition piece. Basements or ground floor rooms on a concrete slab. The thermal layer will prevent the slab from absorbing heat from your heated floor system. New construction where you have control over the height of all floor types and can make them all even. Second-story bathroom floors that are above a heated room. Spaces where the extra height is an issue. Ditra Heat Duo integrates a thermal break into the underside of the mat for the thinnest heat system + thermal break combination yet. Nominal 5/16” (8mm) thickness. Added bonus: Ditra Heat Duo doubles as a sound control barrier with a Delta IIC contribution of 20 when tested per ASTM E2179 in a thinset assembly with porcelain tile. If used on a floor above another room, expect significant noise reduction between the two spaces. Schluter specifically calls for unmodified thinset for the installation of Schluter Ditra Heat. Most big box stores only carry modified thinsets, which won't cure properly when used to install Ditra Heat. In 2017, Schluter introduced their own line of specially-designed thinsets, including Schluter All Set, a strong modified thinset approved for use with Schluter's waterproof systems. Make sure you use either UNMODIFIED thinset or SCHLUTER ALL SET for your installation as specified by Schluter Systems or your installation may fail and Schluter will not honor any warranties. We stock Schluter All Set in white every day in our store. Share these heat systems with a friend!